The words 'Music for Life' with information about featured artists at an AIDS Benefit Concert for Gay Men's Health at Carnegie Hall, New York City on March 14th, 1993. Colour lithograph by Zahor & Bender Incorporated. New York City : Gay Men's Health Crisis, 1993. Music for Life. An AIDS Benefit Concert for Gay Men's Health Crisis. Carnegie Hall. 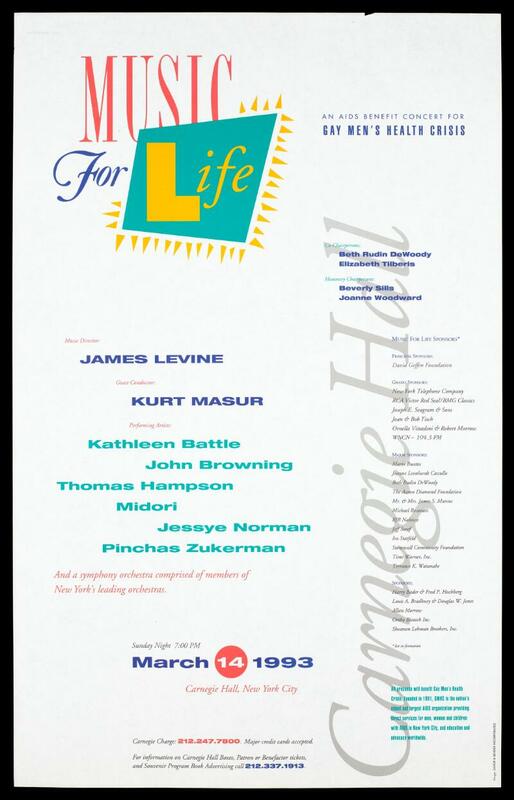 Music Director: James Levine ... and a symphony orchestra ... Sunday ... March 14 1993 Carnegie Hall, New York City ... Co-Chairperson: Beth Rudin DeWoody ... Music for Life Sponsors*: Principal sponsors: David Geffen Foundation ... All proceeds will benefit Gay Men's Health Crisis ... Design: Zahor & Bender Incorporated.